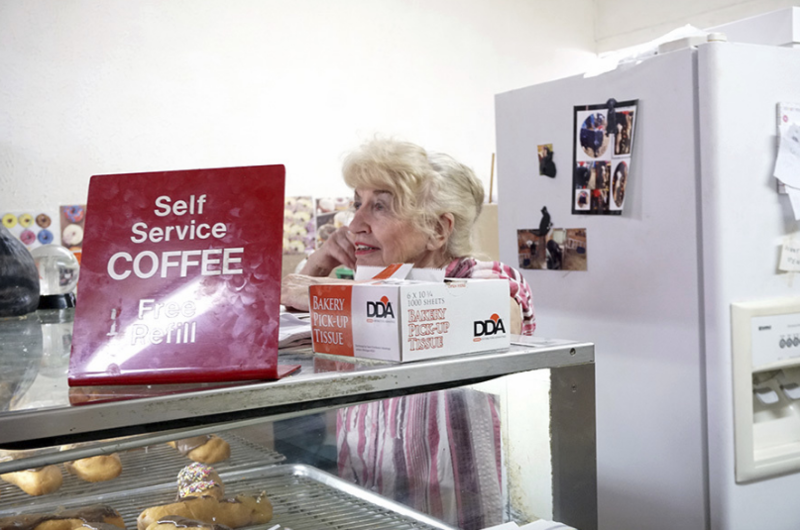 Donut Stop, an icon on 13th street Omaha is closing shop at the end of the month. Hal Rodgers purchased and founded the original store in Nebraska City. Later, he opened stores in Shenandoah, Iowa and various spots in Southwest Iowa. In the early 1980s Hal and Marlene moved out to Hawaii and opened a Donut Stop there in 1983. Marlene and Hal opened the current store in 1988. Hal passed away in 2014 and Marlene has been keeping the business going strong since. Local concert attendees from Sokol would frequent the shop in the late hours of the night. The shop is usually open until 1:30 a.m.
“The atmosphere was very inviting, and the donuts were good,” said Nate Chavez. “It’s a family atmosphere and you just like being in there.” Chavez would frequent the shop after concerts in the area. Donut Stop has attracted customers from every corner. Donut lovers would even make a quick stop on their way to the airport for a quick snack. For some people though, it’s not just about the donuts. While some people give sentimental value to the shop, some just enjoyed the décor and atmosphere. “The shop smelled amazing,” UNO student Jimmy Carroll said. “I had about two or three donuts and I didn’t really want to leave,” he said. Carroll added he has only been there a few times, but always enjoyed his experience in the shop. As for the “Donut Stop” name Rodgers said that after the shop closes she is going to sell the building but keep the name. “I told him (Hal) I would try to take the business on by myself for two years, and now it’s been five years,” Rodgers said. She said wants the shop to be remembered by the quality of the donuts. The slogan “Where quality begins” highlights how much the owner(s) really tried to always keep their donuts top-notch. The last day for Donut Stop will be Oct. 31st, Halloween night. The store will be operating under regular hours, so take advantage of the last month and grab a delicious pastry for a good price.